Hello, everyone! Today I'm posting for the fabulous Secret Garden Crafts. If you're not familiar with this AWESOME company, you will want to stop by and check out their amazing store. They're having a special right now where you can get absolutely FREE SHIPPING on any orders that are $20 or more. That's a fabulous deal, and their flowers and leaves are SO gorgeous! You won't want to miss this special deal. And....Secret Garden Crafts is one of the many fabulous sponsors of the Winter Coffee Blog Hop. I used some Echo Park patterned paper and stickers (snowman, heart, snowflake border), half a white doily, and I ran some Brown Center Stitch Burlap trim across my card. Then I used some lovely Secret Garden Crafts goodies to embellish. I started with one Green/White Fern Leaf and one Light Green Mulberry Leaf. Near the Mulberry Leaves, I added a small piece of fresh cinnamon stick and I tucked in several Brown Flower Stamens and White Flower Stamens. I topped that little ribbon and flower treatment with some white Miniature Sweetheart Blossoms and some red Sweetheart Blossoms. I also added some more of the Brown Flower Stamens and White Flower Stamens right by my die-cut coffee cup and sentiment for an added touch! I'd really like to say thank you for stopping by today. I appreciate your visit, and I really do hope to make it by your blog this week. I normally comment on EVERY entry in the Coffee Blog Hops, but I won't be able to do it this time. Sorry, friends. I have too much going on this time...travel, etc., and just don't have the time to do it all, but please know I appreciate your visit very much. Please be sure to stop by Secret Garden Crafts to see what's new and to take advantage of the special FREE SHIPPING offer. 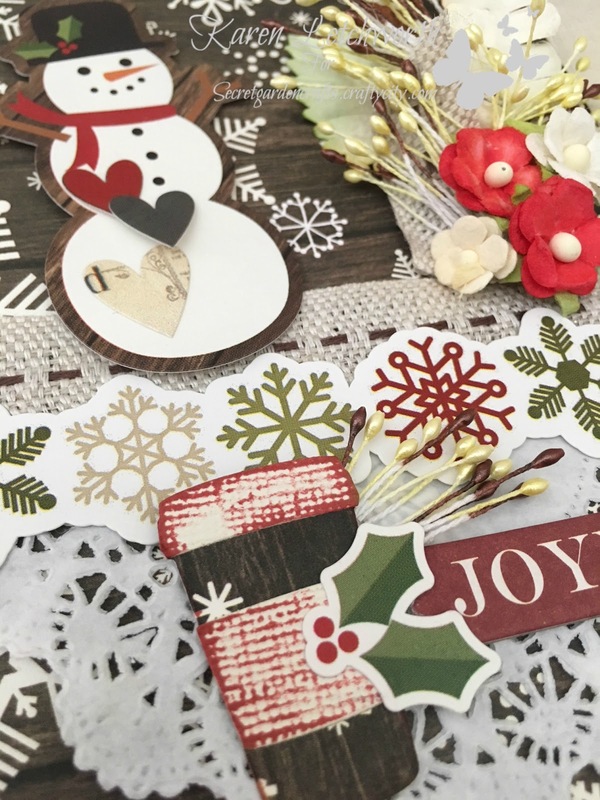 Winter Coffee-Loving Cardmakers Blog Hop - Anything Coffee, Tea or Cocoa Related With Winter Theme. This card uses a Taylored Expressions coffee die called Little Bits - Coffee To Go. 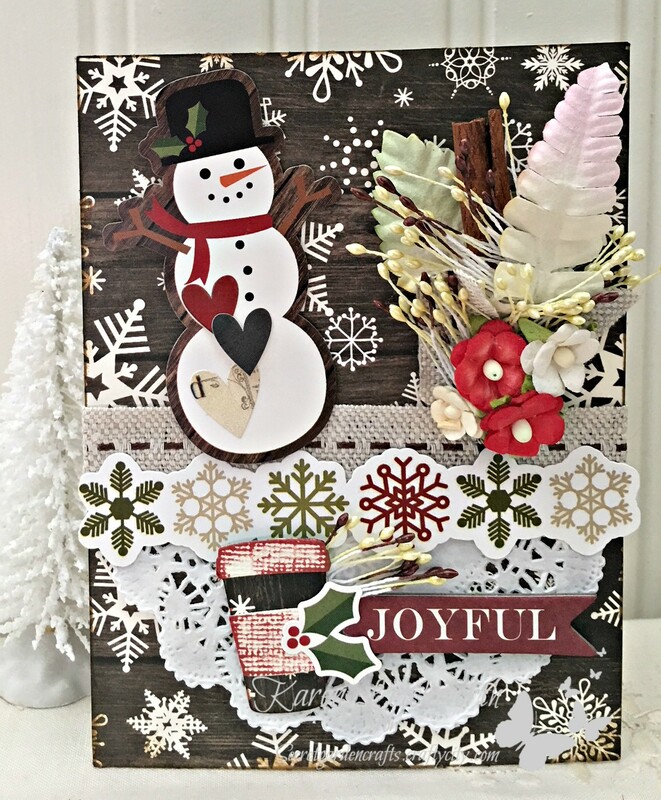 So many gorgeous winter elements on your card. I sure do love that snowman a lot. Oh, another gorgeous card! Love it! Love this fun card. Love all the embellishments and that Echo Park paper! love the little snowman. I like the little hearts on him. I love the cute snowman with beautiful paper, so cute! Adorable! 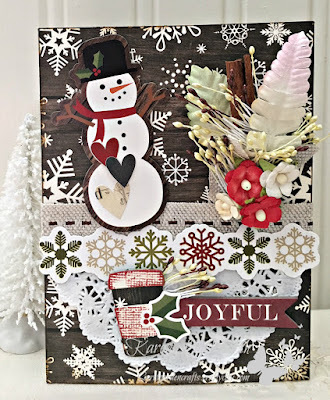 Love the snowman and all of your layers! Great project. I love the wooden background and ist dark shades against all the bright and colorful details on it. Thank you for joining us at Simon Says Stamp Monday Challenge.